Water skiing is both a recreational activity and a competitive sport. 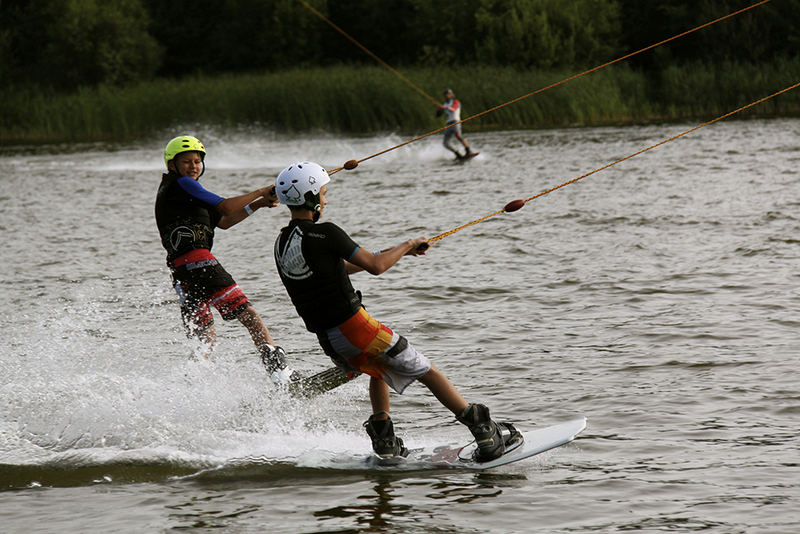 The majority of British Water Ski & Wakeboard's members ski or ride for fun and to keep fit. Water skiing is a surface water sport in which an individual is pulled behind a boat or a cable ski installation, skimming the surface on two skis or one ski. There are many options for recreational or competitive water skiers which include: speed skiing, trick skiing, show skiing, slaloming, jumping, and barefoot skiing. Wakeboarding is a surface water sport which involves riding a wakeboard over the surface of a body of water. It was developed from a combination of water skiing, snowboarding and surfing techniques. There are two forms of wakeboarding: Boat Wakeboard and Cable Wakeboard. Waterskiing and wakeboarding are both fast paced, adrenaline-filled adventure water sports. The majority of watersports are suitable for all ages and level of ability, they also offer a great full-body workout. For more information on how you can get started, visit British Water ski and Wakeboard. Adventure water sports are inclusive; the British Disabled Waterski and Wakeboard Association aims to introduce newcomers to the sport with specialised equipment and guidance for those with a learning disability or physical activity.